It’s been called the “Casablanca” of horrible movies. Tommy Wiseau’s “The Room,” a romantic drama/black comedy, is internationally renowned for its off-kilter dialogue, continuity errors and melodramatic delivery. Since its release in 2003, the film has garnered a cult following, with monthly midnight screenings in San Francisco. Wiseau, the film’s producer, director, writer and star, discussed “The Room” and his current sitcom project, “The Neighbors,” in concert with a showing of the former in San Francisco on April 11 and 12 at the Clay Theatre, at which Wiseau is set to make a special appearance. The Stanford Daily: “The Room” has really gotten a cult following in recent years—did you expect this kind of reception to your film when it was originally released? Tommy Wiseau: No, I thought I’d just make a movie and move on to [the] next project. It didn’t come out right. Maybe the next one would be better. We’ve got the twelfth anniversary of “The Room” this coming June. TSD: What provided you with the inspiration for the film’s premise? TW: Well, originally, it was supposed to be a play, and I wrote the book — 800 pages — then I condensed it to the script. So I wrote a 100-page script. People say that script didn’t exist, but it did exist. To respond to your question: I gathered stuff from real life—different characters, some of my friends, actually, etc., etc. I studied film for quite a few years. TSD: So you attended film school? TW: Yeah, and I remember the first time I did my little project, I got an A-. We used a splicer, but I didn’t splice the right way and I couldn’t go backwards, so I got an A- for it. TSD: For “The Room,” you took responsibility for the entire process of writing, acting, producing, [and] directing from start to finish. How was that experience? The cast of Tommy Wiseau’s “The Room.” Courtesy of Wiseau-Films. TW: It was a roller coaster ride — I used two cameras, the HD and the 35mm. Also, people tried to tamper with the script. I had a script, and people tried to tamper [with it] because I had a different vision of what a regular movie should be — even right now, the sitcom that I’m doing is slightly different. So I changed the crew, I changed the actors. We’re very happy about what happened… people relate to it. I’ve never called it a cult, a cult phenomenon or whatever, but it’s a film where people really enjoy it, interact and have fun with it. You can laugh, you can cry, you can express yourself, but please don’t hurt each other. TSD: “The Room” was originally billed as a romantic drama, but, in recent years, you’ve started calling it a black comedy. What precipitated the change? TW: Actually, I did not change at all. From the beginning, we marketed it as a comedy/black comedy. People don’t realize that the black comedy is leading to melodrama, which is not melodrama. Melodrama is something you cannot relate to because of exaggeration. So when Johnny says, “You’re tearing me apart, Lisa!” — people don’t talk like that, but where I grew up, people actually exaggerated their relationships themselves in real life. So usage of the football and all the elements of “The Room” was, in my mind, like I wanted to put American culture to the movie. So this is the gray area, that people don’t realize how “The Room” has succeeded for so many years — because “The Room” has foundations, like a building has strong foundations. You may push it, but, at the end of the day, the audience laughs. In the beginning, when we had the premiere of the movie twelve years ago, people said, “What is this? What are we watching?” If I did everything how I learned in school, with a formula like in Hollywood, we would not have a conversation today. So I’m very proud of this project. Everything was done intentionally; I was involved from beginning to end. Some of the quirky things with the sound, I say to hell with it, let’s just do it. Let’s just leave it alone. TSD: The process of filming the movie was quite expensive — how did you source the funding for the film? TW: To respond to your question, I have two words: hard work. That’s basically, you know, I used to have a retail store and I design stuff. Right now, I design underwear. So I’m back to design. I create clothing. So that’s where some of the money comes from. Some of it comes from hard work. Buildings in the Bay Area, being involved with small businesses. Some people don’t understand that in America, if you work hard, you can accomplish something. TSD: Who are your directorial influences? TW: Oh, I influence myself, but… James Dean, Orson Welles, “Casablanca,” James Dean in “Giant” and Clint Eastwood. These people did acting and producing. I always believe in original material and these people created original material, like Shakespeare. TSD: How have you found the transition from film projects to a sitcom project (“The Neighbors”)? TW: It is different—you’re shooting differently, number one. It’s not easy, to be honest with you. It’s challenging. The reason I’m doing a sitcom now is because I like something different. But I’m leaning towards movies, feature movies. I don’t like so much reality shows, to be honest, because, right now, reality shows are mostly scripted. It’s like a cheap thrill. So I don’t like to cheat the public. I like to be real. “The Room” screens at midnight on April 10-11 at the Clay Theatre in San Francisco. 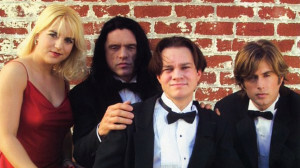 Director and star Tommy Wiseau will make special appearances. For more information about tickets, visit http://www.landmarktheatres.com/san-francisco/clay-theatre/Film-Info/the-room.